Something that a lot of prospective college students don’t think about is how their diet will change when they move out of the house and into new living arrangements for college. Unfortunately, as a result, many students get somewhat shell-shocked after their first few days. For the freshman that start out by living in a dormitory on campus, it starts with the dining hall food. While you probably have had dining hall food back in your high school days, what students don’t realize is that even with such meals for lunch, you are still coming home to a home-cooked meal in the evenings every day. But in college, that is no longer the case. Your entire diet will mainly consist of dining hall food, no longer just being your source of food at lunch, but at dinner and even breakfast as well. 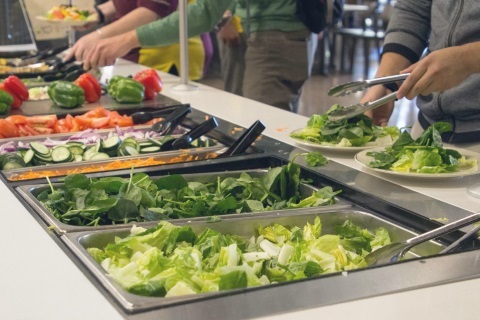 And while dining hall food isn’t inherently bad, the lack of creativity and the necessity for dining halls to mass-produce food can often leave the food bland and uninspiring, if not right away, then over the course of weeks and months as you become used to eating the same things over and over. Plus home-cooked meals made with love are always better, which is something that you’ll definitely miss while at college. However, it isn’t all about the lack of home cooking. Part of the problem with kids moving away from home is their own inherent inability to cook while on their own. Part of this may be due to the fact that most students have never cooked a day in their lives. But the real reason for this “inability” to cook is simply the lack of adequate kitchen space. Most students are living in a dorm, or in a small apartment, both of which typically do not have much in the way of kitchen appliances. In fact, the only thing that you can realistically count on when you go to college is having access to a refrigerator and a microwave. And while that may seem pretty decent on the surface, all this really mans is that you end up eating really unhealthy convenience foods. Things like frozen breakfast sandwiches in the morning, or microwaveable ramen for lunch or dinner. As late-night snacks that will help you get through your study session, they admittedly do the job quite well. However, if such eating habits become more pronounced and a part of your daily (or perhaps nightly) routine, the unhealthy nature of these processed foods really becomes a problem. It’s part of the reason a lot of kids come back home significantly heavier than when they originally left for college (although to be fair, it is not just the change in diet but also potentially the overall decrease in physical activity). So what can you do to combat both of these changes to your diet? To combat both of them, the simplest thing you can do is to force yourself to get a variety of quality food. If your college campus has multiple dining halls, try going to a different one every now and then, to keep things from getting boring. Even if there is a long walk involved, it will be worth it to have some delicious food that you aren’t sick of yet. Or if you have the means, try going out to restaurants off campus to get some variety that way. This is a great way to bond with your classmates, so this is definitely something that should be done on a pretty regular basis (assuming you have the financial and logistical means to do so). Small adjustments like these can really help combat the inevitable (negative) changes in your diet that occurs when you go to college, so be sure to implement them whenever possible!